RobertDouglas announced today that it arranged in excess of $50 million of joint venture equity and senior financing for the acquisition by Haberhill LLC of the 917-key Renaissance Grand St. Louis. The $33 million, five-year, floating rate financing was provided by Deutsche Bank, and will be used to acquire and substantially renovate the hotel. The Renaissance Grand is located at the heart of the St. Louis business district, directly across from the America's Convention Center and the Edward Jones Dome (home to the NFL's St. Louis Rams), and anchors the City's ambitious $4 billion redevelopment program. The hotel, originally the Statler Hotel, enjoys a storied history, its rooftop crystal ballroom hosting many of the City's most famous events, and was expanded and completely re-built in 2004, re-opening as the Renaissance Grand St. Louis. Evan Hurd, a Director at RobertDouglas, remarked that “St. Louis is a top-20 MSA and investors responded very positively to the market once we shared the full story with them.” Upon the completion of a $24 million upgrade of the hotel, which will update all of the guest rooms and renovate the public areas and restaurants of the hotel, Haberhill will convert the hotel to a full-service Marriott Hotel, operating as the Marriott St. Louis. Douglas Hercher, Managing Director at RobertDouglas, noted, “Haberhill's extensive experience with large, branded hotels and complex renovation projects, along with their detailed strategy for re-positioning and re-branding the Renaissance, were critical to attracting capital to the project." St. Louis has enjoyed a recent surge in the performance of its lodging market, with market-wide RevPAR showing double-digit growth in 2014, driven by a balanced mix of business, convention, group and tourism demand. 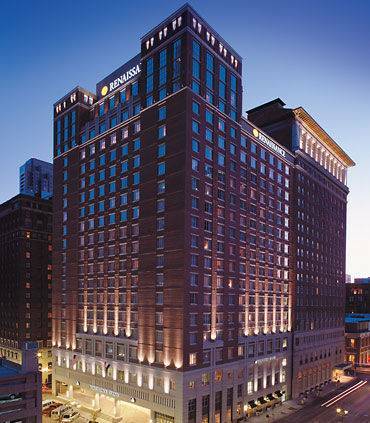 Haberhill's founder, Doug Greene, commented that "I am excited with this purchase and look forward to re-establishing the Marriott St. Louis as the City's leading downtown hotel," adding "the City has been a helpful partner to us through what was a complicated acquisition process and we are confident we can contribute to the continued growth of the City's downtown core."